The self-titled full-legth debut album from Chicago psych-rock act Secret Colours finally saw its official release today. Since I recently interviewed the band and they were kind enough to play some live acoustic songs from their album for me, it's safe to assume that I was interested to hear what their finished album was going to sound like. The album art actually gives a pretty good visual representation of the contents of the album; the music is trippy and classically cool, with accessible, timeless songcraft swirled in a fog of guitar effects and floating over the steady sway of a solid rhythm section. For me, one of the marks of an album with staying power (on my record shelf, at least) is whether or not I find myself singing along with the tracks. The tracks on Secret Colours lend themselves easily to this, and one quickly finds oneself singing along with the band's songs, even without quite knowing the words yet. The delicate counterpoint between strummed acoustic and effects-laden electric guitar and bass on "Love" is one of my favorite parts of the album, with the sweet, gentle contour of the vocal harmonies blending into the psychedelic backdrop created by the instruments without being buried in it. Other high points include the bluesy swagger of album opener "Redemption," the hazy rocking of "Chemical Swirl," and the delightful buildup of energy on "S.O.S." Really, there isn't a bad track on the album. Making a statement like that, I have to admit that my musical tastes definitely run toward the garage/psychedelic realm anyway (so the band's sound pushes all the right buttons for me to begin with), but even so, Secret Colours is a complex, beautifully-captured musical statement well worth adding to your collection, and Secret Colours is definitely a band whose future career is worth watching. 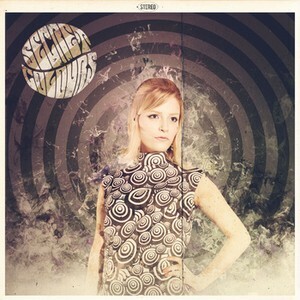 Secret Colours' official album release show (with supporting acts Panda Riot and Geronimo!) will take place this Saturday, August 14, at Beat Kitchen. Doors open at 10 pm, and the show starts at 10:30 pm. $10 admission, ages 17 and up. Tickets are available here. You can check out a recent interview and live-acoustic session I did with Secret Colours here, and an interview with supporting act Geronimo! here. The album Secret Colours is available in CD and digital formats. You can also preview the album here. I love this new album. It's very original. I agree it is a great album where every song is solid and you find yourself singing along! !